Signing up for Dry July - or just need more dry days in your drinking week? Either way, neuropsychologist Dr Nicola Gates can help. A researcher with the University of NSW and author of A Brain for Life, Gates also has a track record of helping people manage their alcohol use - including workers in industries like aviation that demand strict sobriety during working hours. But whether the goal is an alcohol free month or the two alcohol free days each week recommended in Australia's alcohol consumption guidelines she suggests first getting a handle on how much you really drink. "It's something most of us underestimate," says Gates, recalling the time she asked a group of people in one of her mindful drinking seminars to pour what they thought was a standard drink of wine. "One woman poured the equivalent of three standard drinks so the two drinks she thought she was having at night was actually six." Given that men and women should stick to no more than two standard drinks daily to stay at a low risk level of drinking, according to the guidelines, it makes sense to know what this amount looks like. If wine is your tipple, there are two things to think about. One is that a standard drink of wine isn't a generous amount sloshed into a large glass. It's just 10 grams of alcohol which translates into a teeny tiny 100 mls. But this amount gets even smaller as the alcohol content of the wine gets higher, Gates explains. While 10g of sauvignon blanc at around 11 per cent alcohol equates to around 100mls of wine, 10g of a more potent red (around 14 or 15 per cent alcohol) is more like 88 mls. The best guide with any alcohol is to look on the bottle or pack to see how many standard drinks it contains, Gates says. If a bottle of red at 14 per cent alcohol says it contains 8.5 standard drinks (rather than the 7.5 standard drinks in a bottle of white at 11 per cent), it's best to pour a smaller glass. Know why your body loves a break from the booze. Understanding the benefits of dry days or months can help you stay motivated, she says, adding that there's a reason why the word 'intoxication' contains the word 'toxic'. "Alcohol is a toxin which can have harmful effects on the body over time. A holiday from alcohol gives your liver a break from having to process alcohol and reduces the risks of long term alcohol exposure such as liver disease and an increased risk of cancer," she says. 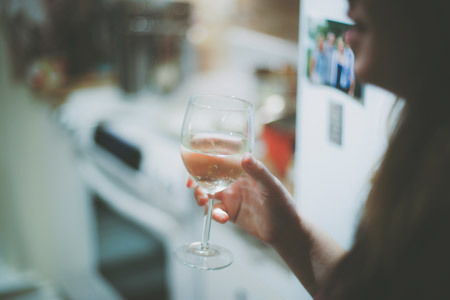 "Alcohol can also interfere with your body's absorption of nutrients which in turn can affect our hormones including reproductive hormones in both men and women. In men too much alcohol can also reduce affect sperm's ability to move - if you want to have a baby, try in Dry July. 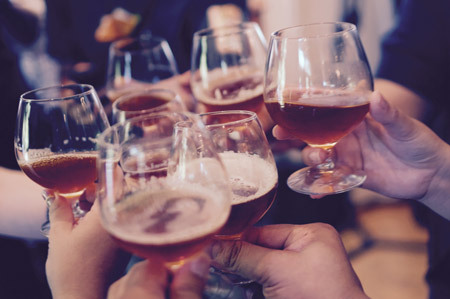 "Time off alcohol also helps you break the habit of drinking regularly - drinking alcohol can easily become an automatic habit rather than a mindful decision." "People drink for different reasons including to relax or to relieve boredom or stress. You need to find something that works instead - it could be a going for a walk, listening to music - or just pouring a different kind of (non-alcoholic) drink that you enjoy," says Gates. "Often it's not the alcohol itself that's relaxing after the working day but just the ritual of sitting and pouring a drink that acts as a circuit breaker." Learn to manage social situations. "Take your own non-alcoholic drink and drink it out of a wine glass. You shouldn't have to defend not drinking but if anyone asks, tell them you're doing Dry July and raising money for cancer or that you're taking a break from alcohol. "If someone tries to persuade you that 'one won't hurt' remember they're just trying to normalise their own drinking because you've made them feel uncomfortable. When we're our own worst critics we're less likely to make helpful decisions but if we can practise self-compassion we're less likely to drink at harmful levels she adds. "Praise yourself when you go alcohol-free whether it's for dry July, a few days or for life." Dr Nicola Gates, Clinical Neuropsychologist, researcher, and speaker, is the best-selling author of A Brain for Life. She has over twenty-five years clinical experience along with a decade of research resulting in internationally recognised publications. Nicola writes for general media and promotes health for brain, body and mind to thousands every year through presentations and workshops. She easily translated complicated neuroscience and medical research and combines it with positive psychology to provide helpful strategies. Through her private practice, Brain and Mind Psychology in Sydney CBD, Nicola continues to support individuals to reach optimal health and wellbeing. As a regular contributor at Golden Door Elysia Health Retreat and Spa, Dr Gates is running a seminar at Golden Door on Alcohol - Mindful Management in July. Find out more about the seminar here.